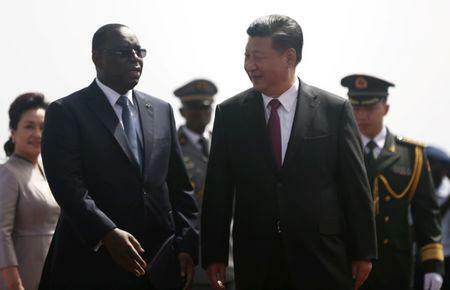 DAKAR (Reuters) - China's President Xi Jinping arrived in Senegal on Saturday for a two-day visit to sign bilateral deals, the first leg of an Africa tour at time when the continent is awash with cheap Chinese loans in exchange for minerals and construction contracts. China now does more trade with Africa than any other nation and Xi's trip - his second abroad since starting a second term under new rules that abolished term limits - will also take him to Rwanda and South Africa, for a summit of BRICS countries (Brazil, Russia, India, China and South Africa). China's consistent overtures to Africa contrast sharply with the United States, whose President Donald Trump has shown little interest in the continent. He will meet Senegalese President Macky Sall for the third time and sign several deals. China's ambassador to Senegal Zhang Xun was quoted in the local press in March as saying China had invested $100 million in Senegal in 2017. Xi was greeted by a brass band and hundreds of people waving Chinese and Senegalese flags and wearing T-shirts with the two leaders' faces on. Africa is in the midst of a boom in infrastructure projects, managed and cheaply financed by China and part of Xi's "Belt and Road" initiative to build a transport network connecting China by land and sea to Southeast Asia, Central Asia, the Middle East, Europe and Africa. China has pledged $126 billion for the plan, which has been praised by its supporters as a source of vital financing for the developing world. In Senegal, Chinese loans have financed a highway linking the capital Dakar to Touba, its second main city, and part of an industrial park on the Dakar peninsula. U.S. officials have warned that a port in the tiny Horn of Africa nation of Djibouti, a host to major U.S. and French military bases, could suffer this fate, although Djibouti rejects the fear. In Guinea, meanwhile, one of the world's poorest nations, China is lending $20 billion to the government in exchange for aluminum ore concessions. As well as trade and minerals, China has also seen Africa as a source of political support. Chinese diplomacy has, as of May this year, succeeded in isolating every African country except the monarchy of Swaziland from Taiwan, which China sees as a renegade province.